What will China’s leadership reshuffle mean for economic policy? Ahead of the cadre shuffle in China next week, most attention will be reserved for the changing of the guard in the Politburo Standing Committee. However, it is important to remember that leadership of party and state leading groups is what really drives policy process and change in China. While a variety of formal and informal power structures define policy fermentation and transmission in China, at the core is a hierarchic system of committees, or leading groups, a 21st century manifestation of the 1920s Leninist Party structure. The committee system effectively fulfills the function of the legislature in common and civil law systems of governance. These leading groups are institutionalized from the highest organs of power to the lowest village organization. The policy portfolios of leaders are fluid arrangements, likely to morph over the course of a five-year administration. The policies which these committees output are interpreted and implemented vertically downwards, moving from vagaries in proto-policy at the central level to specifics in production catalogues, tariff rates, and insurance regulations. Party leading groups, over state leading groups, are the pre-eminant decision-making fora. Xi Jinping’s Comprehensively Deepening Reform Leading Group, in charge of change, is now the most powerful, while Liu He’s Financial and Economic Affairs Leading Group, in charge of money minders, sets key economic agendas. State leading groups, which set functional policy, are currently dominated by Zhang Gaoli, China’s top vice premier, but will necessarily morph and institutionally evolve after the 19th Party Congress, with new personnel to staff the central trade and industry policy apparatus which defines the subnational government and state-owned enterprise (SOE) production system. Zhang Gaoli directly or indirectly ran an almost obscene amount of leading groups through the 2012-2017 period, including the Belt and Road Leading Group. Zhang was effectively running China’s economy through the various energy and industrial policy leading groups, and his expected departure at the 19th Party Congress will leave a policy implementation gap. Miao Wei at the Ministry of Industry has been in charge of strategic emerging industries and Made in China 2025, while in the National Development and Reform Commission (NDRC) He Lifeng heads up the supply-side reform agenda. Other key central industrial policy committees, particularly the State Owned Enterprise Reform Leading Group, are largely split between Ma Kai and Wang Yong. Ma drives the industry 4.0 advanced technology agenda while Wang helps clean up old industry, particularly by engaging the industry associations. Industry associations are the institutional wreckage of the danwei line ministry production system. Carved out as independent institutions from coal, metallurgy, electricity, and building materials ministries, they form a membrane between state and market, representing the interests of industrial assets, capital, and labor at the vice-ministerial level and are responsible for intervening in strategic domestic and international markets such as iron ore.
To achieve both central and regional industrial policy goals, a new wave of leading groups are beginning to emerge. For example the Leading Group for the Development of the New Materials Industry, led by Ma Kai, was established to implement the New Material Industry Development Guide, itself a joint project of the Ministries of Industry and Information Technology (MIIT), Finance, and Science and Technology as well as the NDRC. The guide sets specific goals for the development of advanced, strategic, and new materials. This all integrates with the central Made in China 2025 industrial policy under which China has started developing manufacturing innovation clusters, developing intelligent manufacturing, strengthening the traditional industrial base, and developing capacity in green manufacturing, and high-end equipment manufacturing. Regardless of who winds up taking leadership positions next week, we can expect the reform agenda in 2018-2022 to move past steel and coal and into a variety of inefficient and overcapacity industries. The degree to which individual firms will be subject to market conditions is likely to be dependent on how effectively China’s domestic industrial policy aligns with the international geoindustrial policy. If domestic policy reforms start paying off in external geographies, then expect continued meaningful reform, but if geoindustrial and domestic policy fail to harmonize then European and American firms could calling foul as subsidies creep back in. Old capacity and subsidy problems will necessarily follow state funds to support innovation and transitions into higher value-added manufacturing. For example, new energy vehicle subsidies are to be phased out from 2020. This is likely to result in a rapid overinvestment in low-end capacity now and a tailing off of R&D investment just as the industry would require technology advances to push new frontiers post-2020. Likewise there is as yet no clear plan for dealing with new overcapacity cycles developing in robotics manufacturing, with clear calls for MIIT to develop a regulatory plan to avoid current subsidies sowing the seeds of future overcapacity problems. Current nibbles around the edges of serious SOE reform are unlikely to be transformed into holistic in-system institutional changes in the industrial structure. The sheer scale of cleaning up China’s industrial production institutions without wholesale private ownership, and the bankruptcies that that would necessarily entail, mean that for the second Xi administration, institutional SOE reform will largely be viewed through the ability of large central SOEs to compete abroad. Most economic analyses of the rise of China focus on Keynesian macro accounting — that is, counting what is there. 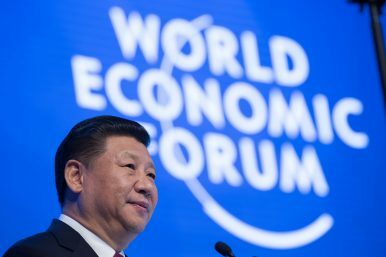 Most international relations and security studies analyses focus on the potential of China’s impact on the world — guessing what might be. However, in order to understand the possible future trajectories of China’s industrial economy and trade policy, analysts should examine extant policy, regulatory, and legal documents throughout the 2018-2022 period and consider the personal politics behind each of the policymakers. Focus on the leadership and policy trajectories of the trade and industrial policy matrix are critical to understanding and planning for China’s impact on global markets and international trade. Why China Won’t Abandon Its Controversial Trade PoliciesWang Huning: China’s Antidote to Strongman PoliticsSouth Korean Foreign Minister to Visit Beijing After China Envoy's North Korea VisitChina to Send Special Envoy to North Korea'A Community of Shared Future': One Short Phrase for UN, One Big Victory for China?